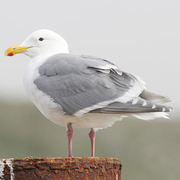 Common in Puget Trough near salt water and very local breeder along Columbia River in eastern Washington, although not yet recorded nesting as far upriver as Kittitas County. Nests in variety of habitats, including sandy islands, in cities on roofs, and on pilings. "Confirmed" BBA records limited to Seattle and Bremerton waterfronts, south shore of Bainbridge Island, and along Green River near Kent. 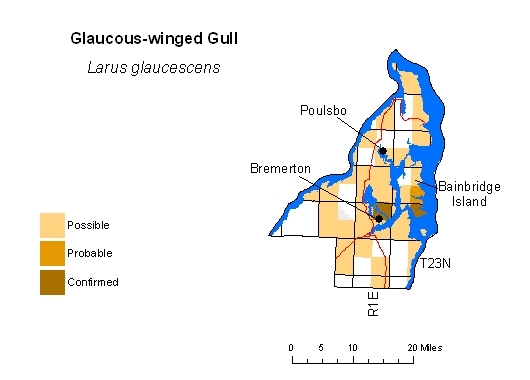 Most locations mapped as "possible" can be assumed to represent birds foraging some distance away from nest sites. In 1980s, Garrett Eddy counted 200 nesting pairs on downtown Seattle buildings (Hunn 1982).